EmQuartier which only opened in May this year is the newest shopping mall in the busy Bangkok Shopping Belt. Located conveniently at Phrom Phong station, it is directly opposite the Emporium, the grand dame of shopping malls here. It turned out that EmQuartier and the Emporium share the same management and hence the “Em” in its name. 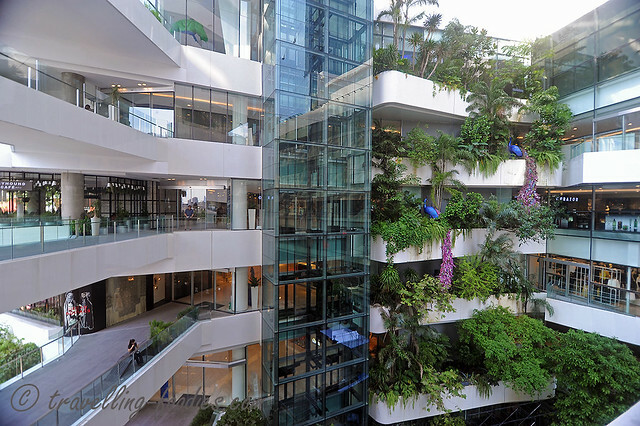 Luxurious and spacious just like many malls that dotted along Suhkumvit Road, EmQuartier houses many haute boutiques on its numerous floors. 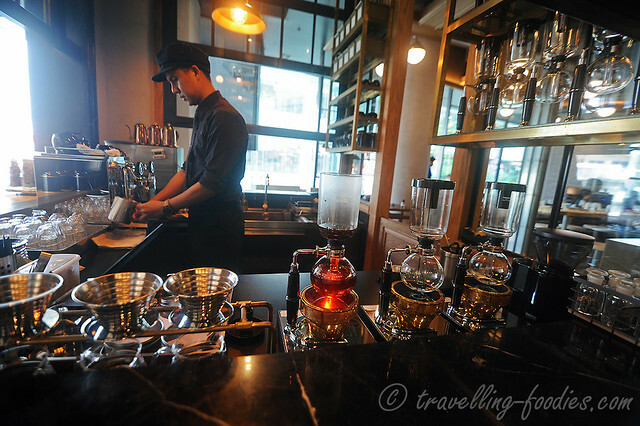 The highlight of this place is a large gourmet market at the basement as well as dessert wing where counters representing quite a number of dessert and pastry shops in Bangkok can be found. 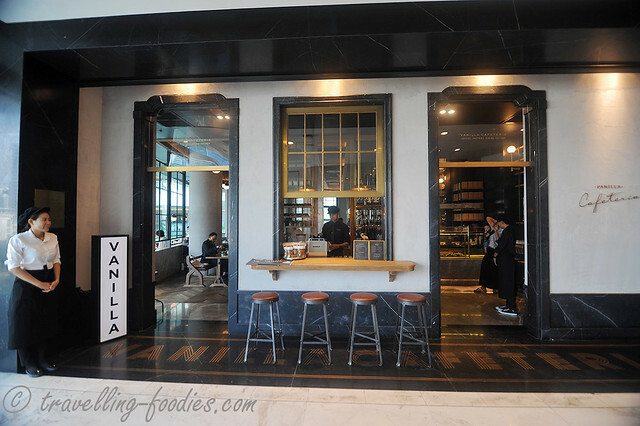 Vanilla Cafeteria situated on the second level of EmQuartier is the latest establishment of the “Vanilla Industry”, with sister shops in Siam Paragon, Silom Square and Ekamai. It is essentially a full-scale cafe which not only offers coffees and cakes but also a proper all-day dining menu. Crepe creations seem to be their speciality but we had wanted something more substantial. 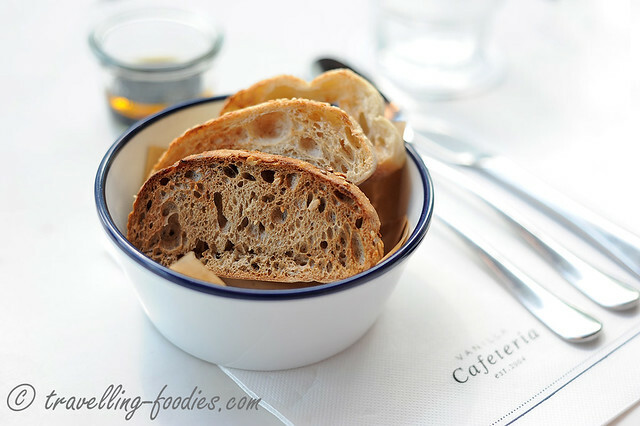 Their bread basket, with a small selection of freshly baked bread slices which had been toasted prior to serving. Butter is available but only upon request. The service staff here are very friendly but unfortunately their command of English was rather limited, save for one of them who spoke rather decent English and understood what we had wished to order. 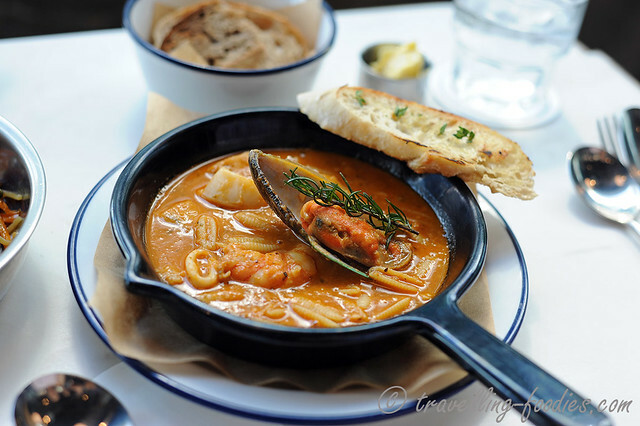 We started with the Provence Seafood Soup served with a wedge of toasted baguette. In the soup itself was a small selection of seafood which includes mussel, scallop, large river prawn (quintessentially Thai!) and a piece of seabass fillet if I remember correctly. The soup which was primarily a Bouillabaisse Marseillaise was very rich and deep in flavor, yet surprisingly refreshing at the same time, owing to the tomatoes added. It was incredibly sweet from the melange of seafood and vegetable broth and also hearty, with the addition of conchiglie, a clever choice of pasta which allows the sauce to adhere and be contained within the crevices of the “shells” with each spoonful. 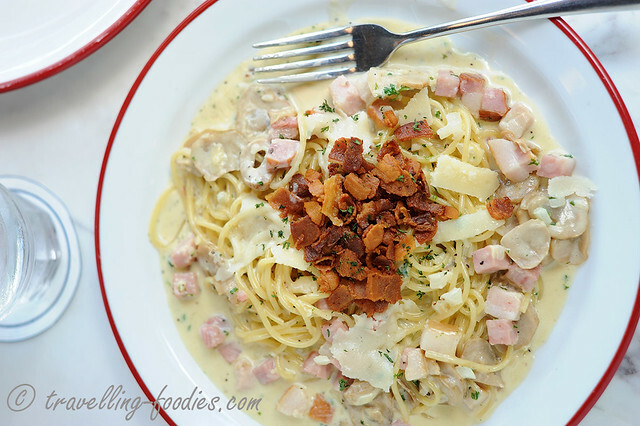 J’s order of their Signature Carbonara, always a litmus test to their pasta cooking skills. Like the soup, the portion was very wholesome, easily a meal sufficient for two petite ladies or children. The ingredients were as generous as the pasta portions, i.e. ham, mushrooms, freshly shredded Parmesan, not forgetting the garnishing of fried bacon chips. The sauce was really eggy, just the way I like my cabonara but seemingly a tad runnier than what I would have liked. But this small misgiving doesn’t really affect the overall enjoyment on the whole. We ordered a main dish to share, i.e. 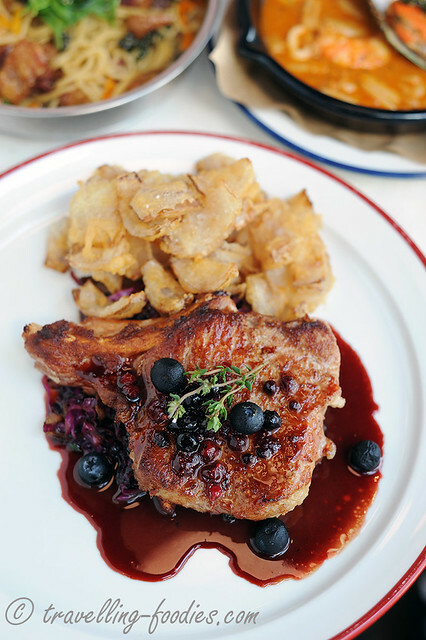 Smoked Pork Chops with Raspberry Gravy, that was served with onion fries and sauteed red cabbage. I loved the red cabbage which upon soaking up the deliciously tart raspberry sauce reminds much of sauerkraut! The sauce by itself was quite something, fruity and sour at the same time which helped to whet our appetites throughout lunch. The problem lies however in the pork chop itself. Despite being beautifully browned, the meat texture was a tad on the tough and chewy side. If more attention was put into tenderising the meat in the mise place, I think it would have been much better a dish. 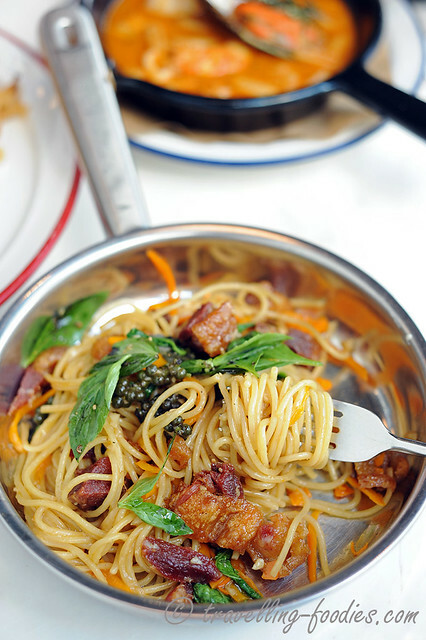 Crispy Pork Knuckle Spaghetti is my order of pasta and I was dying to try out the fusion pasta dishes on the menu. Essentially an aglio e olio styled dish, the ingredients comprised largely of their own local spread. Orange Thai chili pepper was used together with fresh green peppercorn which had been sauteed to impart their flavour unto the oil before tossing in the cooked spaghetti. I loved the pork knuckle, so uber crisp! And of course a generous handful of fresh Thai basil leaves added at the end basically brought the aromatics up a notch. Rightfully after a good meal should come dessert but we were absolutely filled to the brim, one of the cursed habits of over-ordering and hence overeating. 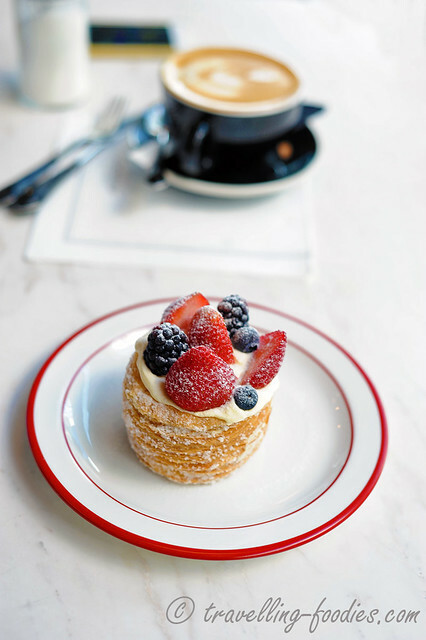 This beautiful puff pastry piece topped with fresh cream and an assortment of fruits aux rouge and cuppa cappucino were actually ordered by a lady at the adjacent table who was curious about what I was doing with my camera. This dainty little confectionery piece looked really yummy and I will definitely here again to try out other parts of their menu! This entry was posted on December 23, 2015 by Alan (travellingfoodies). 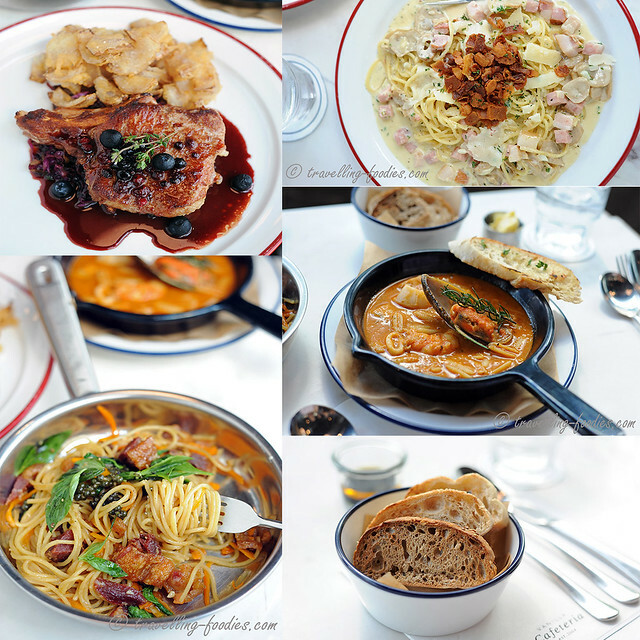 It was filed under Food, Travel and was tagged with bangkok, Emporium, EmQuartier, Phrom Phong, thailand, Vanilla Cafe.